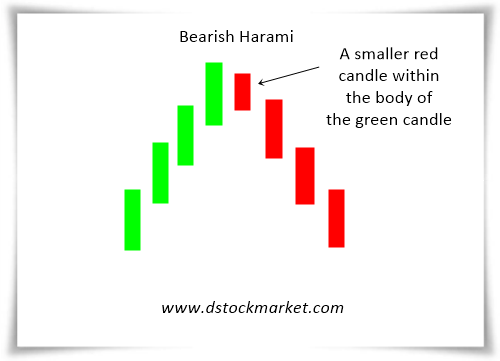 The bearish harami is a candlestick reversal pattern that is often found at turning points of a stock. This pattern signals that a bearish reversal is about to happen. The stock will have a run up for a few days and form a large green candle only to open lower the next day. This causes bulls to start questioning the health of the bull run. When the next candle drops below the low of the green bar, the mindset of market participants changes to a bearish mode. The bearish harami is also known as a pregnant candle. That's because when you look at this candle pattern, it looks like the side of a pregnant woman. The diagram above shows the construction of the bearish harami. The stock has a bullish run and then the stock gap down to open lower. The body of the red candle is within the body of the previous green candle. The presence of a red candle after many green candles make the bulls question whether the bullish run is about to end. When another red bearish candle forms and goes below the low of the green candle, this confirms the pattern. The mindset of market participants changes and there will be traders who will start to short this stock. 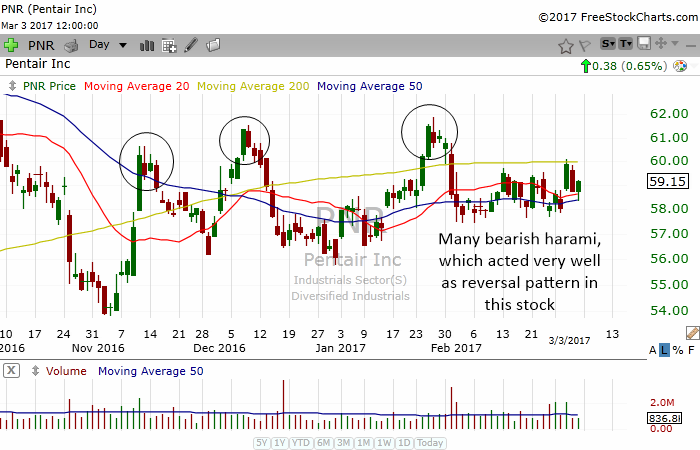 When a bearish harami pattern forms, the stock can have a bearish reversal which can last for days. This gives the astute trader an opportunity to short the stock for a swing trade. 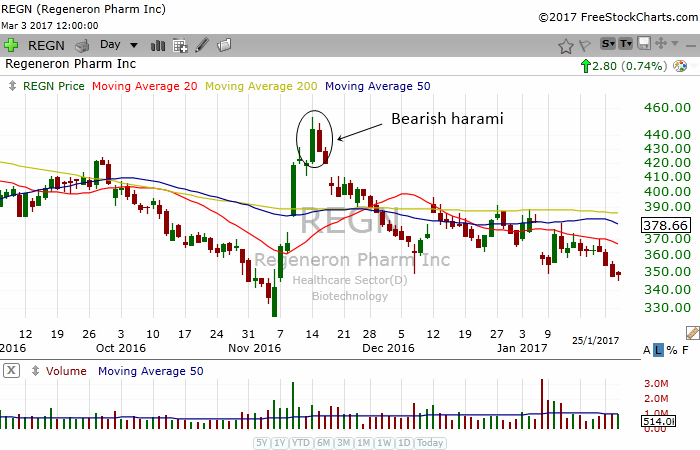 The chart of REGN is a textbook example of the bearish harami in action. 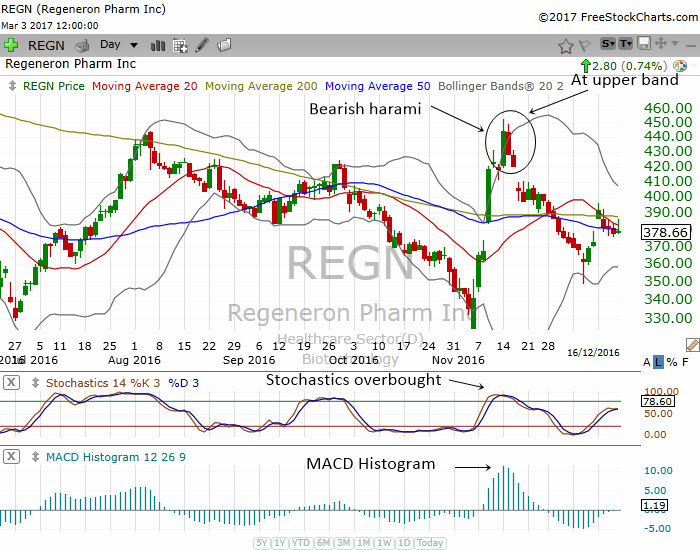 REGN had a bullish rally for a couple of days. The stock look set to have a mighyt bull run but a red candle formed within the green bar. This immediately told us that the bulls were losing control. They were unable to push the stock higher. The bears came in and the bearish harami marked the short term top for this stock. Look how the stock had a gap down and then it slowly drifted lower in the coming weeks. The chart above is the chart of OXY. You can see how this stock had a rally from November to December. However, the rally was a bit erratic and it was hitting a resistance area. 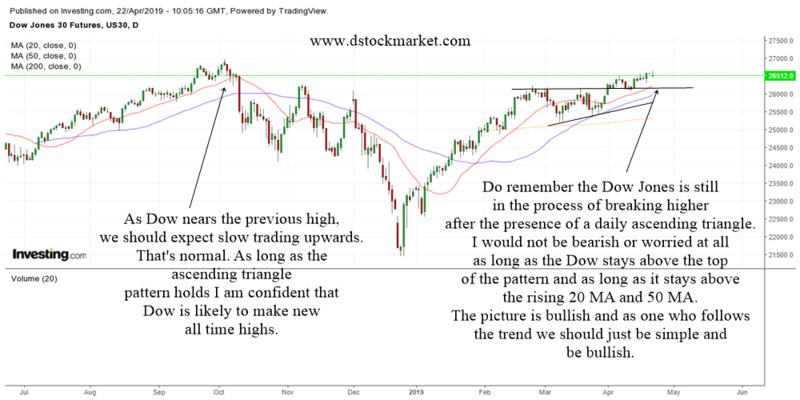 A large bullish candle appeared in mid December which tells us that the bulls were trying to push this stock above resistance. But the next day, the stock formed a red candle. The bearish harami pattern formed at resistance and also at the 200 day moving average which can act as a powerful psychological resistance area. Since the appearance of the bearish harami, this stock has slowly drifted lower. This shows us how powerful a bearish harami pattern can be when it appears at resistance areas. The chart of PNR above tells us how a bearish harami pattern can hint of a reversal time and time again. There were 3 bearish harami in this chart. One in November, one in December and the last one in late January. Notice how all 3 of them are a little different. It does not really matter as long as the green bar is followed by a red bar with their bodies staying within the body of the previous green bar. The 3 bearish harami provided great swing trading opportunities to the downside for the observant trader. 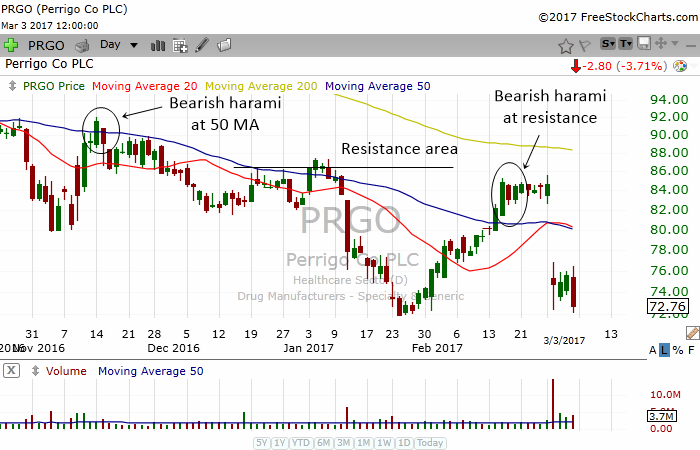 PRGO had two bearish harami. 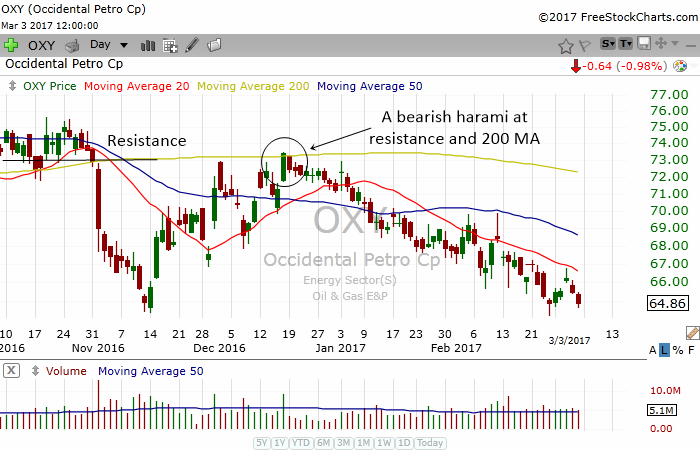 The first one was in mid November where the bearish harami formed at the 50 day moving average which can act as a powerful resistance. Look how the stock drifted lower. The second bearish harami was formed in mid February. The stock had a nice rally until it hit the resistance area. Although the stock formed a bearish harami, it did not fall immediately. But those who were observant would have exited the stock. A bearish harami forming at a resistance area is usually a strong signal that the stock is going to move lower. Eventually the stock gap down. Just like many other Japanese candlestick patterns, you can increase your odds of success by combining the bearish harami with Western indicators such as the Bollinger Bands, the Stochastics and the MACD. The chart above is the same stock as the first chart in this article. I have overlayed the stock chart of REGN with the Bollinger Bands, the stochastics and the MACD Histogram. The stock was at the upper band of the Bollinger Bands. A stock tends to bounce off its upper and lower bands. The stochastics were showing an overbought reading and promptly gave a sell signal. Then the MACD Histogram which was forming a hill started to decline showing us that the momentum to the upside was slowing down. All these told us that the stock was ripe for a bearish reversal. Traders who were observant could have entered this stock for a nice swing trade to the downside.